While Chihuahua city is every bit the modern metropolis, the rest of Chihuahua state, Mexico’s largest, is mostly desert. Yet Agnico Eagle’s Pinos Altos is one of several mines that lie in the westernmost region of Chihuahua, near the small town of Basaseachi. Famed for its slender waterfall, Basaseachi lies at the very north of Mexico’s copper canyon region, known globally for its natural beauty. Despite its altitude of almost 3,000 metres above sea level and the desert-like nature of the rest of the state, this mountainous region is surprisingly green. ‘Pinos Altos’ means Tall Pines in English, a good descriptor. But these mountains aren’t just picturesque; they hide valuable metals that have driven Mexico’s economy for decades. International interest in Mexican mining remains strong with the country’s abundant resources of gold, silver, zinc, copper and iron. Unlike many other Latin American countries, Mexico’s top miners increased spending in 2017 and the outlook remains optimistic. Mexico remains the world’s largest producer of silver and a top-10 gold producer. The Mining Chamber of Mexico recently listed gold as the country’s number one target mineral. While Agnico Eagle has been present at Pinos Altos since 2006, the history of mining on the site stretches back to the 18th century. While there are proven reserves, the amount of mining that has taken place previously creates added complexity today. ”After 282 metres of surface mining in the Santo Niño open pit, economic and geotechnical studies revealed it was better to continue the project underground rather than to continue with deeper surface mining,” says Fernando Viezcas, underground operations manager at Pinos Altos. Marco Perea, general manager Pinos Altos, Agnico Eagle. As the gold mine transitioned from a combined surface and underground operation to a fully underground operation, maximizing yield and recovering the mineral-rich crown pillar without exposing employees to any additional risks became a priority. The pillar, which lies between the bottom of the open pit and upper level of the underground, challenged the technical knowledge and operational experience of the team. The quantity and quality of its ore justified the time spent finding a method to extract the pillar with minimal risk. For this project and the ongoing underground operation, safety was paramount. “We launched a technical feasibility study to establish if it was possible to recover ore from the pillar without generating instability for the under- ground operation and the pit slope,” says Marco Antonio Perea Gallegos, general manager of Pinos Altos. In addition to its being the first project of its kind in Mexico, the technical study and proposal gained recognition from the American Rock Mechanics Association, a professional and international engineering and scientific society that promotes interaction among rock mechanics and geomechanics specialists, practitioners and academics. Sandvik DL411 is an electro-hydraulic, longhole drill rig engineered for large-scale production drilling in underground mines. The tele-remote functionality allows a trained operator to control the drill rig from a safe distance when there is a higher rockfall risk. Agnico Eagle also uses Sandvik rock bolters and retains three Sandvik technicians who work full-time at Pinos Altos to provide immediate support, maintenance and advice when needed. The good relationship extends through all levels of the organization. 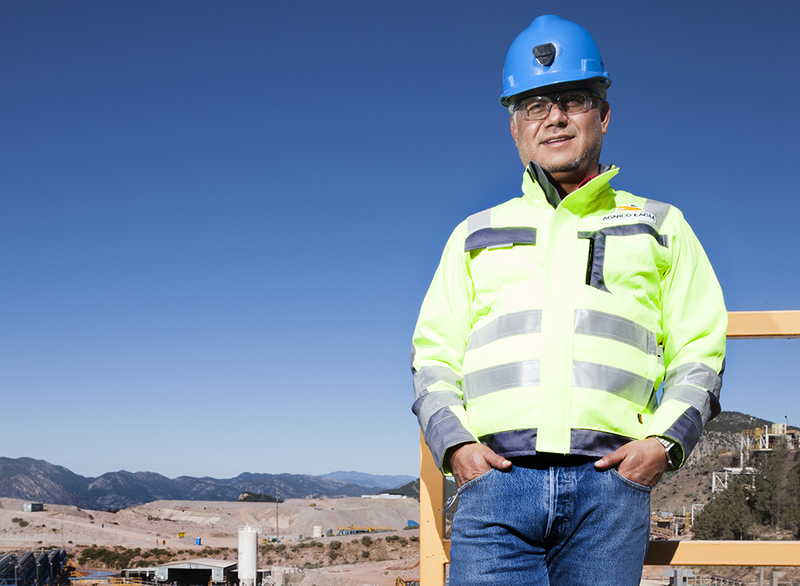 Fred Camuñez, one of several Sandvik DL411 operators at Pinos Altos, says the test of any relationship is when a challenge arises. Agnico Eagle is responsible for the full mining cycle, including drilling, blasting, extraction and backfill, currently producing at a rate of 5,500 tonnes of ore per day. Typically, operators drill in a fan pattern through rectangular blocks of 15 by 15 by 30 metres. Due to the risk of instability, a Sandvik cable bolter is used to support the drifts and excavations. The extraction is situated in a bottom sub-level, below the stope, so there is a regular feed of broken ore available for loading. The longhole sub-level mining method improves safety and increases production, while keeping costs competitive with surface operations. Minor issues are not uncommon at Pinos Altos because of the hard, fractured characteristics of the rock. In such a challenging environment, the flexibility of Sandvik DL411 is a timesaver. It can drill holes with a diameter ranging from 64 to 115 millimetres and a depth up to 54 metres while the boom offers 360-degree rotation with a wide-tilt angle. Camuñez values this flexibility. The availability of high-quality ore in the crown pillar at Pinos Altos necessitated the Sandvik DL411 solution. Fernando Viezcas, manager underground mining operations, Agnico Eagle. Sandvik DL411 features a remote operation mode that gives the operator complete control. Full functionality is offered using the same control unit. The operator can watch the drill in action in real time on a monitor thanks to the networked camera that can be placed in a suitable position next to the rig. While the risk of rock fall remains very low, the team at Pinos Altos take no chances. By remotely operating Sandvik DL411, the operator and support staff can be well clear of any potential problems with no drop in productivity. This focus on safety filters through every part of the operation at Pinos Altos. As the mine can only be reached by a slow, twisting road through the mountains, employees stay locally. The mine runs buses to and from the adjacent communities and has even built a full-service camp with all services to accommodate external staff. comfort with everything they need to do their jobs quickly and efficiently. More than 1 million ounces of gold reserves remain at Pinos Altos, so the future here looks bright for both Agnico Eagle and Sandvik. Agnico Eagle is a Canadian- based gold producer with operations in Canada, Finland and Mexico, and exploration activities in the USA. Pinos Altos was the company’s first Mexican mine. The mine produced 229,243 gold ounces in 2017. Currently around 1,200 employees work at Pinos Altos.